There is nothing timid about the details of this Western style handcrafted chair. Brilliant and vivid colors combine to make this a spectacular, custom designed chair. The upper inside seat back, the armrest, and the lower front of the chair are upholstered in radiant, red, stained full grain leather. 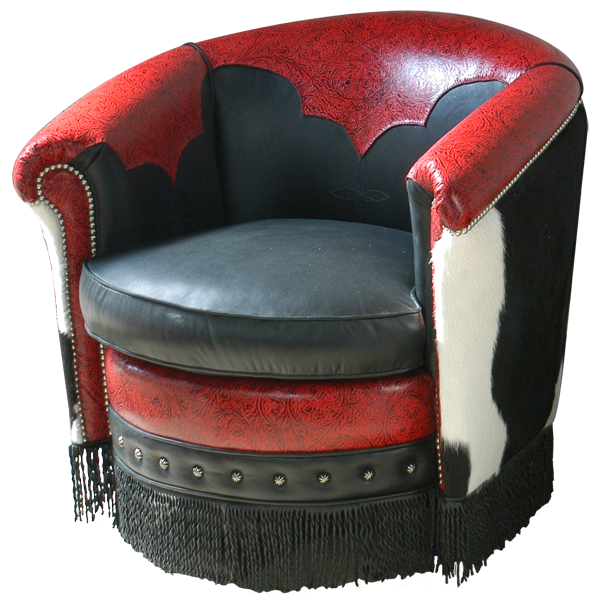 The lower inside seat back, the cushion, and the lower front of the chair are upholstered in glamorous, black full grain leather. The top of the seatback and the armrest are decorated with Western cut designs. 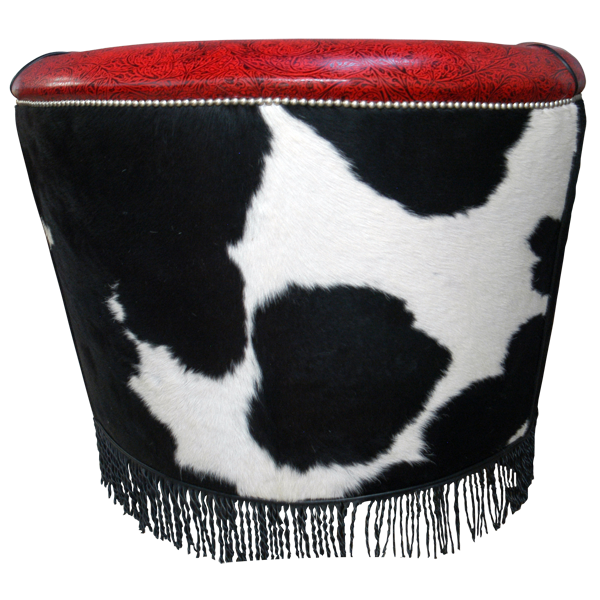 The reverse seat back and its lateral sides are upholstered in black and white patterned, real cowhide. Leather fringe is hand tacked to all sides of the wood base of the chair. The upholstery is precision hand tacked with wider nails on the lower rim of the chair, and smaller nails on the armrest. The wide cushion, along with all of the leather in the chair, is double stitched for extra strength and durability. The entire chair rest on a durable quadripartite revolving support. The chair is guaranteed for life and is 100% customizable.